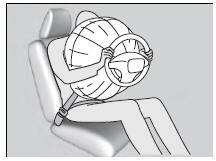 While your seat belt restrains your torso, the front airbag provides supplemental protection for your head and chest. The front airbags deflate immediately so that they won't interfere with the driver's visibility or the ability to steer or operate other controls. After a front airbag inflates in a crash, you may see what looks like smoke. This is actually powder from the airbag's surface. Although the powder is not harmful, people with respiratory problems may experience some temporary discomfort. If this occurs, get out of the vehicle as soon as it is safe to do so. Although the driver's and front passenger's airbags normally inflate within a split second of each other, it is possible for only one airbag to deploy. This can happen if the severity of a collision is at the margin, or threshold, that determines whether or not the airbags will deploy. In such cases, the seat belt will provide sufficient protection, and the supplemental protection offered by the airbag would be minimal. Minor frontal crashes: Front airbags were designed to supplement seat belts and help save lives, not to prevent minor scrapes, or even broken bones that might occur during a less than moderate-to-severe frontal crash. Side impacts: Front airbags can provide protection when a sudden deceleration causes a driver or front passenger to move towards the front of the vehicle. Side airbags and side curtain airbags have been specifically designed to help reduce the severity of injuries that can occur during a moderate-to-severe side impact which can cause the driver or passenger to move towards the side of the vehicle. Rear impacts: Head restraints and seat belts are your best protection during a rear impact. Front airbags cannot provide any significant protection and are not designed to deploy in such collisions. Rollovers: Seat belts and, in vehicles equipped with a rollover sensor, side airbags and side curtain airbags offer the best protection in a rollover. Because front airbags could provide little if any protection, they are not designed to deploy during a rollover. Because the airbag system senses sudden deceleration, a strong impact to the vehicle framework or suspension might cause one or more of the airbags to deploy. Examples include running into a curb, the edge of a hole, or other low fixed object that causes a sudden deceleration in the vehicle chassis. Since the impact is underneath the vehicle, damage may not be readily apparent.